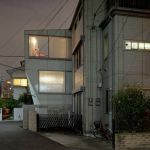 A House is a compact private residence is nestled within the dense expanse of Tokyo, in Nishi-Azabu—a neighborhood characterized by narrow streets and traditional low-rise houses—which borders a park heavily visited during the spring, when the city’s cherry trees begin to bloom. Its 136-square-meter area consists of five horizontally divided spaces, each connected by a minuscule sculptural spiraling staircase that, given the footprint of the house, allows for loft-like spaces within its intimate confines. Oversized windows punctuate the house, each with two layers of glazing; one is transparent and one is of the same relief glass that wraps the façade. These oversized windows, with their dual layers of glazing, can be countlessly reconfigured, to regulate the interior flow of daylight. Both the transparent and relief glass of the house’s windows slides on tracks, which extend to double the width of each, for unobstructed views. 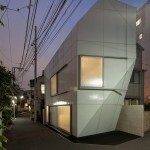 They also extend to the floor, to ensure that the house remains responsive to passing street life. When closed, they cloak the house within an iridescent texture. On the ground floor, one of these windows serves as the main entry, and slides open to reveal the kitchen. Each level has a different program: the lowermost consists of storage and technical spaces; the lower two bedrooms, permeated by daylight via sliver windows that span the full length of the house, at street level; the kitchen and dining room occupy the ground floor; the living room the first; and the uppermost a master suite, with a wooden ofuro. A small terrace is attached to the master bedroom, yet it is expansive, relative to the house’s size. Its northeastern wall is composed of the same textured glazing that shields the house’s windows, except that there is no layer of transparent glass behind it, as the terrace is completely open to the exterior elements. When retracted, a balustradeless view toward the park suddenly appears. When closed, the view is obstructed, which introverts the terrace and imparts privacy within this publicly exposed level of the house. Conversely, the southwestern wall of the terrace is also the pinnacle of the house’s textured façade, into which a cut was created to introduce ample interior daylight to the master suite. The cut left a void in that wall of the terrace, which in turn created an enveloping exterior space, roofed only by the sky. Due to the house’s slender site, a fold was created along its southern façade, angled so that it retreats from the street-site boundary at ground level; it provides just enough space for a Smart car. Subtly bold when seen from afar, the house blends into its context. And when all of its windows are opened, or when a combination of several are open and closed, the house morphs to expose its kaleidoscopic qualities to the neighborhood and its residents. Structurally, it is composed of concrete, and is earthquake proof in accordance with stringent local regulations. Centrally sited within Tokyo, with the possibility to turn toward the city, or retreat into itself, all in multiple configurations; A’ House is an idiosyncratic private residence engaged in a continual dialogue with its traditional context, which simultaneously anticipates the future.